New York is no resort town. 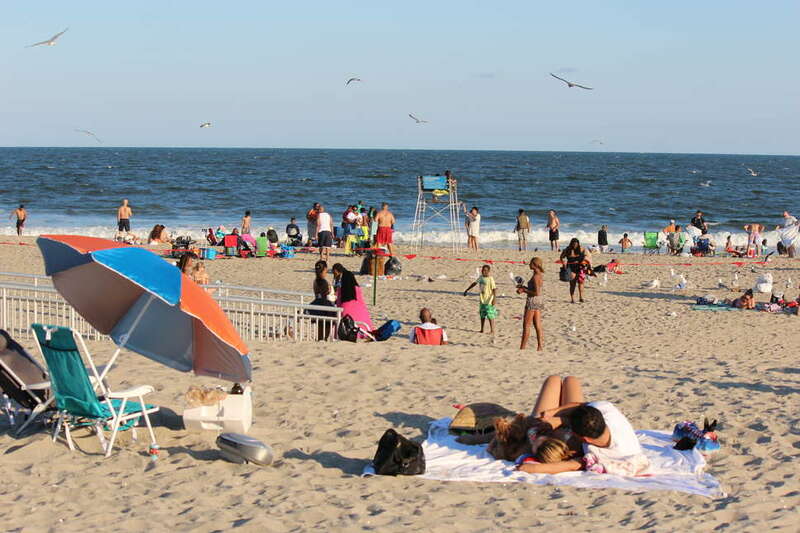 Although there’s an entire Manhattan-length stretch of sandy shores, salty waves, and summertime eats throughout the outer boroughs, our 14 miles of public beaches are nearly tourist-free. 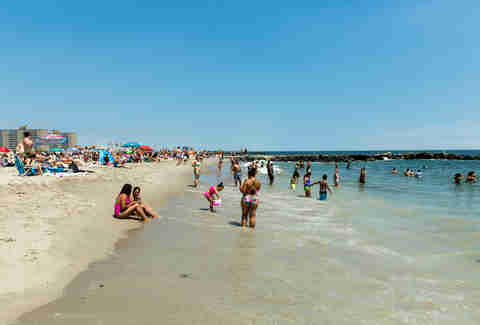 And Rockaway Beach in Queens is among the best. Since Superstorm Sandy, Rockaway Beach has rebuilt its 5.5-mile stretch of boardwalk, with new businesses moving in each summer to attract a crew of beach bums eager to surf or just bask in the sun on the expanse of sand rivaling any of the East Coast vacation destinations you’ve been ogling on Instagram. Oh, and did we mention it’s totally free to get on the beach? Forget the LIRR or whatever Jersey transit you were going to mess with this weekend: Your best summer day is at Rockaway Beach, and this is how to do it right. 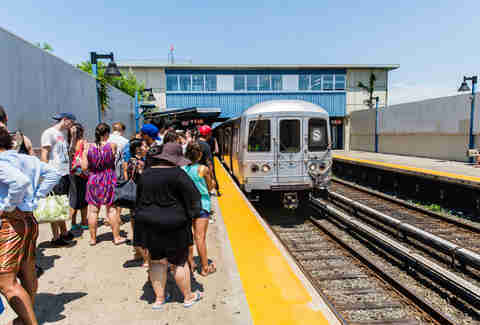 With just the swipe of a MetroCard, you can take the A train to beach entrances at 105th Street and 116th Street. The area between 91st Street and 102nd Street is closed due to land and safety conditions. If you’d rather hop on a party bus, book a ride on the Rockaway Beach Bus ($19.95 one-way, $29.95 round trip), an air-conditioned coach bus that has various pick-up spots in lower Manhattan and North Brooklyn and offers cold drinks while you travel. For a more relaxed ocean voyage, hop on the Rockaway Ferry ($2.75 each way), which leaves from Wall Street and Sunset Park and lets you catch some beachy breezes before you even get to shore. If you’ve got a friend with a car, free street parking and parking lots get you right to the beach and you can come and go as you please. Rideshare apps like Lyft Line and UberPOOL can also can also help you minimize costs and maximize convenience. If you’re a competent biker, bike paths all the way out to the boardwalk help make a two-wheel journey to the beach easier than cycling through Midtown. If you forget sunscreen, towels, or other beach accoutrement (or simply don’t own them) Rockaway Beach’s CVS (at 90th Street), Duane Reade (at 116th Street) and a 24-hour Rite Aid (at 108th Street) vend all the sunny day necessities. Didn’t bring enough booze? Head to Ship to Shore Wine Shop (88-08 Rockaway Beach Boulevard) for something better than Bud Light and maybe even sneak in a free tasting before heading back to the sand. Discreetly beach-proof that rosé with a Corkcicle or S’well bottle. Get to Rockaway early for oceanside breakfast tacos, fresh bagels, and icy smoothies. This is Rockaway’s best bagel. Plump, hand-rolled dough in classic varieties is kettle-boiled and oven-baked, and schmeared with occasional kooky confections like Fruity Pebbles cream cheese. Wraps and sandwiches are compact eat-on-the-beach treats. If your beach style is more Venice than NYC municipal public park, head to this California-style juice and smoothie kiosk doling out seasonal breakfast items like an egg sandwich covered in fresh greens, homemade granola with yogurt, and various types of avocado-less toast. Start your morning with a sugary kick at this bakery from former North End Grill pastry chef Tracy Obolsky. Croissants, muffins, pecan-topped sticky buns, and plenty of colorful and creative specials are all baked fresh each morning for a grab-and-go breakfast to scarf down as you scout out your beach spot for the day. 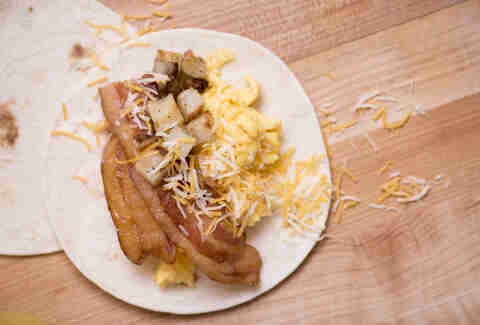 Helmed by an Austin transplant, this breakfast taco hub serves a simple yet superb menu of egg-filled tortilla creations. Built on flour tortillas imported from Texas, these refried bean, potato, egg, and bacon creations (which you should coat in a healthy dose of hot sauce) are perhaps the best fuel for a day of laying in the sun. Pack up your stuff with plans to relocate after you eat lunch or grab your valuables and let your umbrella and towels save your seat for whenever you return. Fans of the East Village original won’t be disappointed by this beloved Venezuelan restaurant’s beachside outpost. Serving a roster of popular arepas like La Del Gato (cheese, plantains, avocado) all contained in hot corn-cakes, Caracas offers up the perfect handheld beach food. To cool off, go for the sangria slushies, available in red or white -- or as a twist. A favorite of Rockaway Beach goers from the pre-Sandy era, the newest rendition of this temporarily defunct taco joint is located inside Rockaway Beach Surf Club (which, despite the name, is not a club at all but rather an open-to-all indoor-outdoor restaurant, bar, and events venue hosting movie nights and local artwork viewings). 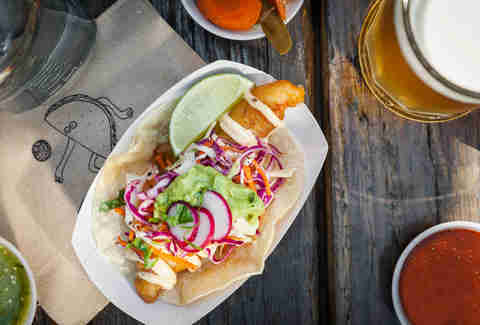 It’s all about the fish tacos here, served fried to a delicate crisp with plenty of slaw tossed on top for extra crunch. Peruvian rotisserie chicken may not be your idea of beach food, but hear us out before you go running for hot dogs: This juicy, fall-off-the bone bird is made for sharing, and you’re more than welcome to use your hands to dig into the meat (which can be paired with sides like rice, beans, avocado salad, and two types of plantains). Grab a bird (and its accoutrements) to go and feast on the beach until the inevitable food coma sets in. You’re here for one thing: the Super Burrito ($12), stuffed with tons of chicken, carnitas, or, for an extra buck, steak -- plus Jack cheese, rice, beans, avocado, sour cream, and pico. Vegetarians can opt for the poblano burrito, and all diners should add a heavy dose of homemade red and green salsas. For an air-conditioned respite on a super-hot day, look no further than this curry, noodle, and fried rice-slinging Thai restaurant, complete with ocean views so you won’t feel like you’re missing out on precious beach time. If the water has you in a seafood mood, go all in for the $28 deep-fried snapper (or a slightly healthier version grilled in a banana leaf). Healthy eaters flock to this seasonal off-boardwalk restaurant that’s similar to Manhattan lunch spots like Dig Inn. Choose a main like baked salmon or grilled lemon chicken and fill up your plate with hot and cold sides like refreshing slaws and salads. Juices, smoothies, and acai bowls help chase it all down, and if you’re in a sharing mood, take a side of baba ganoush or hummus back to the beach. This central Asian restaurant was one of the early newcomers to post-Sandy Rockaway, quickly becoming a favorite for mid-summer carb-loading. Uzbek, Russian, and other Silk Road staples are all on the menu, meaning various iterations of dumplings, kebabs and, of course, borscht are all available for your mid-beach binge. Stay past sunset to experience Rockaway’s laid-back nightlife. The seaside outpost of the landlocked LES bar of the same name hosts art shows and live music. Nightly food specials (think hot sandwiches and hot dogs) as well as fruity drinks set the tone as a DJ spins dance-worthy hits and classics until 2am. Leaving this dive with a frozen piña colada-filled styrofoam cup is a Rockaway rite of passage. Before you head back out to catch the sunset, chat with regulars at the neighborhood mainstay. Be sure to order the empanadas and, if it’s a Tuesday, check out the open mic. Last call is shortly before 4am. 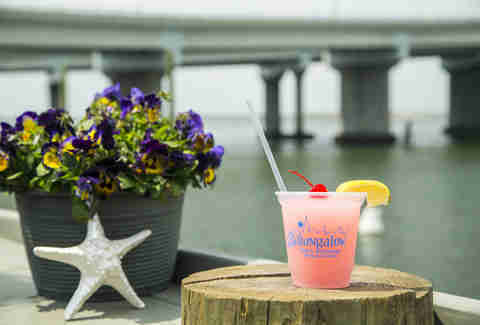 Another popular beachside jaunt, this laid-back bar is good all day, from boozy brunch, through nighttime tide-side cocktails. Satisfy your saltwater cravings with a seafood tower stacked high with East and West Coast oysters, lobster, and clams, before filling up on a lobster roll or plate of pasta tangled with seafood. Unwind after a day of sunbathing in this trendy wine bar’s spacious backyard. More than a dozen well-curated wines are available by the glass for under $10, along with tapas-style bar bites like cheese plates, olives, and charcuterie. Melissa Kravitz is a writer based in NYC who spends a significant part of her summers reading glossy magazines on Rockaway Beach. Follow her on Twitter and Instagram.